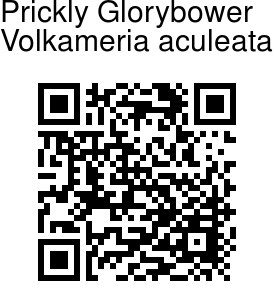 Prickly Glorybower is an erect spiny shrub about 3-6 ft tall. Stem is grayish brown, woody, young branches pubescent, obtusely quadrangular, older branches armed with spines at the leaf-stalk base. Leaves are simple, opposite, ovate-elliptic, lanceolate-elliptic, oblong, 2-6 x 1-2.5 cm across, base narrow, margin entire, tip blunt to flat, hairless and shining on the above, slightly lighter beneath, lateral veins about 4-8 on either side of the midvein, leaf-stalk robust about 0.5-1 cm long. Flowers are borne in lax, stalked cyme about 1-2 cm long, bracts narrow. Flowers are complete, bisexual, zygomorphic, calyx tubular, pubescent, 5 toothed, truncate, subactinomorphic, usually accrescent in fruit, corolla hypocrateriform, 5 petalled. Petals are nearly equal, ovate, yellow, white, hairless, corolla tube narrow, cylindric, about 1.5 cm long. Stamens are 4 didynamous, much protruding from the middle of the flower tube, filaments threadlike, anthers oblong, style threadlike, 2 fid. Fruit is a schizocarp with 4 fleshly single seeded mericarps. Prickly Glorybower is native to S. America, cultivated in parts of India. 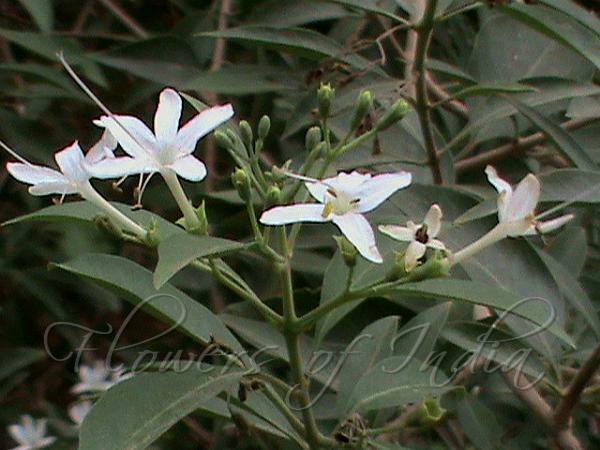 Medicinal uses: Prickly Glorybower is used in home remedies. Photographed in Chennai, Tamil Nadu.